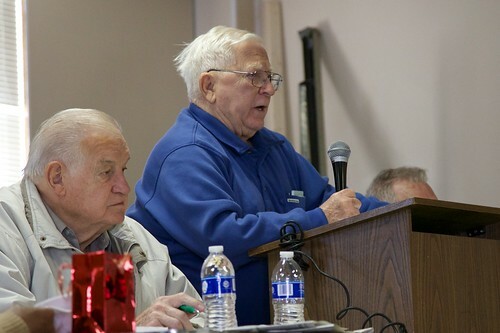 Donald Kellner, the President of the Steel Workers United and Retirees, local 4977. I was born and raised in Baltimore. We’ve lost our basement employment, and the biggest thing we’ve lost is the hope and the future of a lot of young people. I just think it’s sad, I go down to the point a lot; I ride by it and it brings tears to my eyes to believe that this is what happened after all of the years that we put in. Sparrows Point was the life of Dundalk. It was the hard bone of Dundalk. Everything we did centered around Sparrows Point. You know, the events, we had the steel bowl game, football games each year. Everything we did, the community did, we did it as a whole with Sparrow’s Point. I believe the only salvation of the American public is a union. No matter what you think; and unions sure as hell have their faults. But if it isn’t for a union, young men and women don’t have a future in this country. You can’t all work at McDonalds, you can’t all work at stupid paying jobs and you can’t all become lawyers. You need a manufacturing and industrial job. If we don’t fight for some manufacturing bases in this country, there ain’t gonna be any left. Sparrows Point was father-to-son, and son-to-son, and son-to-grandfather; it was repetitive family tradition. You know, if you went down there and your dad worked down there and you went down there; some of these guys got half of there relatives working down there, and that’s the way it was. That’s the way it was at General Motors and Western Electric, it was a great plant to work. And we just became hung up in manufacturing, and we just couldn’t get out of it. We had the first and last strike that the plant has seen since 1959, we struck for 116 days. My son was born the day we went back to work, and I went back to the plant to go back to work, got called back home again. So, it was tough, it was tough on a lot of people, 116 days. And yes it worked, we went back to work poor but we had our benefits.